Scary Monsters magazine #89 - 22nd Anniversary Issue! 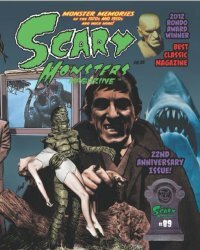 MyMovieMonsters.com > Scary Monsters Magazine > Scary Monsters 1-100 > Scary Monsters magazine #89 - 22nd Anniversary Issue! Scary Monsters magazine #89 is the 22nd Anniversary Edition, highlighting monster memories of the 1970s and 1950s. A scare-packed 131-page issue of the 2012 Rondo Award Winner for "Best Classic Magazine." ... a whopping 131 pages!